The Flowtite composite pipe could be installed without the use of heavy cranes. Arequipa City is a popular destination for both commerce and tourism and its strategy for growth includes a plan for improving and expanding its potable water network. 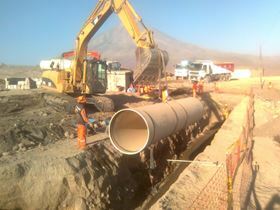 The composite pipe manufactured by O-Tek Internacional forms a gravity-flow pipeline which conveys water from an intake in the Chili River to the La Tomilla II water treatment plant. La Tomilla II’s first stage is designed to handle 34.2 million gallons/day (1.5 m3/s). Three different pipe diameters were used: 43 inches (1100 mm); 47 inches (1200 mm); and 51 inches (1300 mm). Internal pressure requirements range from 145 to 464 lb/in2 (10-32 bar). Pipe installation included two independent tunnel segments. In one tunnel – 623 ft (190 m) in length – the pipe is installed as an interior liner. As a result, the pipe is not affected by internal water pressure loads or external soil pressure loads. The other tunnel – 4167 ft (1270 m long) – uses aerial pipe installation according to manufacturer recommendations. Because the composite pipe weighs less than metal or concrete alternatives, transportation and installation was easier and less expensive. In addition, the ability to nest smaller diameter composite pipe within larger diameter pipe reduced shipping costs. O-Tek, of Medellin, Colombia, manufactured the pipe using licensed Flowtite technology. The process combined continuous and chopped glass fibres in an AOC Vipel polyester formulated to proprietary Flowtite specifications. The smooth pipe interior ensures excellent flow properties that allow for smaller diameters than pipe made with alternative materials. O-Tek Internacional is part of Grupo de Inversiones Mundial (IMSA), also headquartered in Medellin, Colombia. IMSA is licensed to produce Flowtite composite pipe using technology provided by Flowtite Pipe Amiantit´s Technology Centre in Sandefjord, Norway. Haydale and Flowtite have formed a new joint development agreement (JDA) to develop GRP pipeline products.